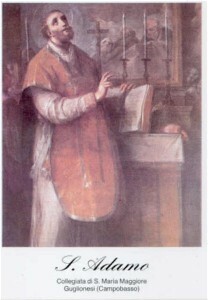 Saint Adamo Abate was a well know Benedictine Abbot, he was in agreement with the unification of the Southern populations in Italy under Ruggero II. He was born around the year 990 in Petacciato and was baptized in Guglionesi. He died on May 3 between the years 1060 and 1070.